Nasal decongestants are a class of medicines many people feel they cannot do without. Providing almost instant and somewhat lasting relief from the joy-sucking that is nasal congestion and blessing us with the gift of breathing without causing any noticeable harm greatly recommends decongestants for use. However, a closer reexamination of their health effects and a reevaluation of their effectiveness compared to other, more natural alternatives reveals they are not as harmless or efficient as they appear to be. Unlike many medicines, nasal decongestants unclog our nose in a couple of minutes. For this reason, many people are convinced they are efficient and feel they should continue to use them. But at what cost? Nasal decongestants are aggressive medicines, full of side effects. From nosebleeds, headaches, insomnia and hypertension to tachycardia, palpitations, stroke and hallucinations, they abound in side effects and health risks that are not actually worth the trouble. How do nasal decongestants work? 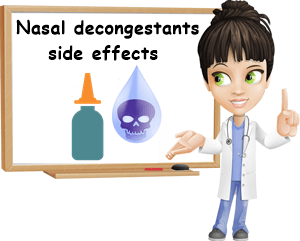 Nasal decongestants are pharmaceuticals (medicines) used for relieving nasal congestion. They can be found in the form of drops, tablets or sprays, which is the most popular form. They are meant for short-term use which means that treatment is limited to 3-5 days and a very small amount of the product. Most products of this kind stimulate certain receptors in the brain in order to increase its production of epinephrine or norepinephrine, two neurotransmitters that are responsible for blood vessel constriction. This leads to blood vessels in the nose shrinking and reduces inflammation, hence the relief they provide. As harmless as their action may appear, it is not well-regulated because the active ingredient in decongestants doesn´t only act locally. Tablets reach our entire system through the digestive tract, while nasal sprays and drops tend to drip down our throat from our nose, reaching the stomach and, from there, entering our bloodstream. This is why most decongestants list high blood pressure and other cardiovascular problems as side effects. Moreover, epinephrine and norepinephrine being two forms of adrenaline, they stimulate the nervous system as well, an action with its own set of side effects and health risks. Lastly, the active ingredients in nasal decongestants further interact with other pharmaceuticals, producing more health problems over time. Of course, limited use has not been shown to produce any harm, but decongestants are not really something people use cautiously. And the more we use them, the better our body tolerates them, sending us on the path of addiction. And nasal decongestants addiction is not something that can be shaken off easily. 1) Dry nose and nose crusts. 2) Irritation of the nose lining. 4) Nose bleeds and blood in mucus. 6) Sleep disorders such as insomnia. 9) Rebound congestion (rhinitis medicamentosa). This occurs in cases of prolonged use. And considering that using nasal decongestants beyond the recommended 3-5 day limit may very well cause the same congestion all over again, then what is their purpose after all? 3) High blood pressure (hypertension). 6) Increased risk of stroke (especially in predisposed individuals). 8) Increased ocular tension (particularly in glaucoma sufferers). 9) Pregnancy complications (possible in cases of prolonged use). 11) Increased risk of respiratory tract infections. Prolonged or continual use of nasal decongestants damages the sensitive mucosa of our respiratory tract. This mucosa is lined with tiny hair-like structures called cilia, as well as mucus, and helps trap and remove foreign bodies that make their way into our airways. Nasal decongestants basically interfere with our respiratory tract´s self cleaning function by drying out mucosas, putting us at risk of infections. 1) Hypertension and coronary artery disease sufferers. 2) Individuals with high stroke risks. 3) Diabetics (due to blood pressure-related problems). 4) Narrow-angle glaucoma and cataract sufferers. 5) Anyone suffering from insomnia, anxiety, panic attacks. 6) Pregnant women and nursing mothers. 8) Anyone suffering from liver problems. Nasal decongestants may interract with medication prescribed for any of the above-mentioned conditions. So what do we gain from using nasal decongestants instead of relying on similarly efficient alternative natural remedies? Side effects, that is what we have to gain. Nasal decongestants only target congestion as an unrelated symptom and thus offer a sort of pseudo-relief considering they do not approach the cause of congestion. Alternative remedies work better in reality because they target the cause of our congestion and, as a result, relief comes natural. 1) Saline nasal sprays. They keep the nose lining moist, preventing dryness, crusts, irritation and bleeding, which helps contribute to relieving congestion. A Neti pot is also a good option. 2) Drinking plenty of liquids (water, herbal teas, fruit juices). This makes mucus more liquid and thus easy to expel. Together with saline solution drops and sprays, it contributes greatly to relieving nasal congestion. 3) Use steam. Taking a hot shower or breathing in steam while leaned over a pot of hot water can help free the airways and relieve stuffiness. 4) Avoid dairy products which may cause mucus to become stickier and go for spicier foods (if your stomach allows for it). 5) Go for plant based products. A menthol-based nasal spray or saline solution spray with added herbs (aloe vera, eucalyptus, chamomile), mentholated vapour rub, bath salts or essential oils to add to bath water or hot water pot may help. 6) Rest, eat well and take your vitamins. This should help speed up recovery and eliminate the causes triggering congestion. The sooner we recover from sickness, the sooner our symptoms will ease and cease. Conclusions. Nasal decongestants do not treat congestion, but simply fake relief at the cost of our nose, heart and circulatory health, to say the least. Many people, myself included, have ended up building such a great tolerance to nasal decongestants that the products simply became inefficient at relieving congestion. But we risked a difficult addiction and serious side effects. While I was not really convinced at first that I was better off relinquishing decongestants, turning to alternative remedies helped me realize that they produced the exact same results, but without the side effects.